A cerebrovascular accident, or stroke, is a sudden alteration in the blood circulation of the brain, due to the obstruction of an artery or the rupture of its walls. In Western countries, strokes are the third greatest cause of death and the greatest cause of acquired handicaps (motor coordination, sensory and intellectual deficiencies). They affect all ages, but the risk increases after 60 years of age and in the event of arterial hypertension, atherosclerosis, diabetes, or aneurysm. Smoking, alcoholism, and family history also increase the risk. A stroke requires emergency hospitalization. Immediate treatment diminishes the risk of irreversible neurological lesions and death. Recurrence is frequent and 75% of people who survive have sequelae of varying severity. The symptoms of a stroke appear suddenly and can differ depending on the nature and site of the lesion: paralysis, vision and language problems (indistinct speech, difficulty finding words, or understanding others), sensitivity (numbness) or coordination (trembling, clumsiness) problems, vertigo, loss of consciousness, violent headache, convulsions, etc. When the symptoms of a stroke disappear spontaneously in less than 24 hours, it is a transitory ischemic accident. This type of accident, caused by a brief interruption of the blood irrigation of the brain, constitutes a warning signal since it often precedes cerebral infarction. It requires an emergency medical consultation. Cerebral infarction represents 80% of strokes. It follows the obstruction of a cerebral artery by embolism or thrombosis. 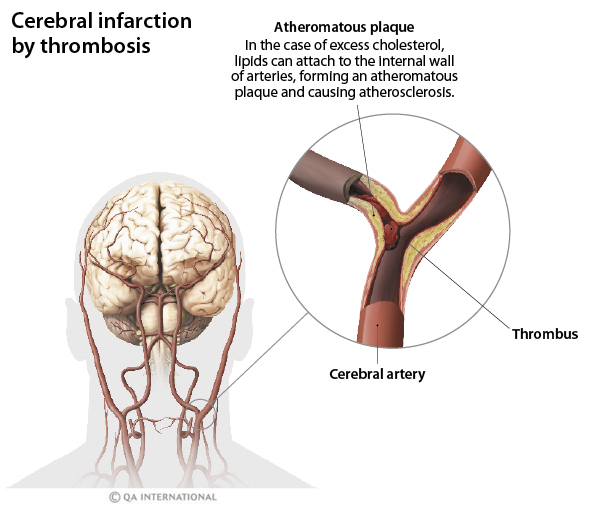 In the case of thrombosis, the obstruction is caused by a blood clot (thrombus) that forms directly in a cerebral artery, at an atheromatous plaque. It is the most common cause of cerebral infarction. In the case of embolism, the obstruction is created by a foreign body having migrated to the brain, often a blood clot that formed in the heart or detached itself from an atheromatous plaque. The infarction causes the interruption of the blood flow to the brain, and, to a varying extent, the destruction of its tissues. It can also cause the formation of a cerebral edema or develop into intracerebral hemorrhage. 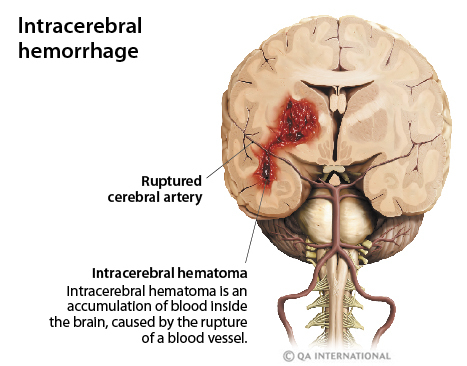 Cerebral hemorrhage, which represents 20% of strokes, often takes the form of blood effusion inside the brain (intracerebral hemorrhage), caused by the rupture of a cerebral artery. It results in the destruction of nerve cells as well as the formation of a hematoma and sometimes edema. The main cause of intracerebral hemorrhage is arterial hypertension, which weakens the blood vessels. The blood effusion may not occur in the brain, but between the meninges that cover it (meningeal bleedings). More frequent in women, meningeal bleeding is generally caused by the rupture of an aneurysm. A cerebral edema is an accumulation of fluid in the tissues of the brain. Its causes are varied: cerebrovascular accident, cranial trauma, tumor, etc. Cerebral edema leads to headaches and neurological problems (language problems, hallucinations, blindness, amnesia, decrease in strength and sensitivity, loss of consciousness). It may cause intracranial hypertension as well as compression of the brain and is a common cause of death. Preventing cerebrovascular accidents lies mainly in detecting warning signs, obtaining rapid medical attention, and reducing risk factors. A poor diet (excessive consumption of salt and saturated fats), lack of exercise, stress, smoking and alcoholism are all other factors that predispose an individual to stroke by increasing the risk of arterial hypertension, atherosclerosis, hypercholesterolemia, diabetes, etc. It is important to monitor these problems and treat them by adopting a healthier lifestyle. People who have already suffered from a transitory ischemic accident should be particularly careful.